If you have little kids like I do, you know that sometimes they can say the funniest things. Every time something funny comes out of one of my kid’s mouth, I can just picture it as a comic strip. I have been thinking of a way to capture those funny things with my digital scrapbooking and came up with a funny page that I would include in the photo albums. 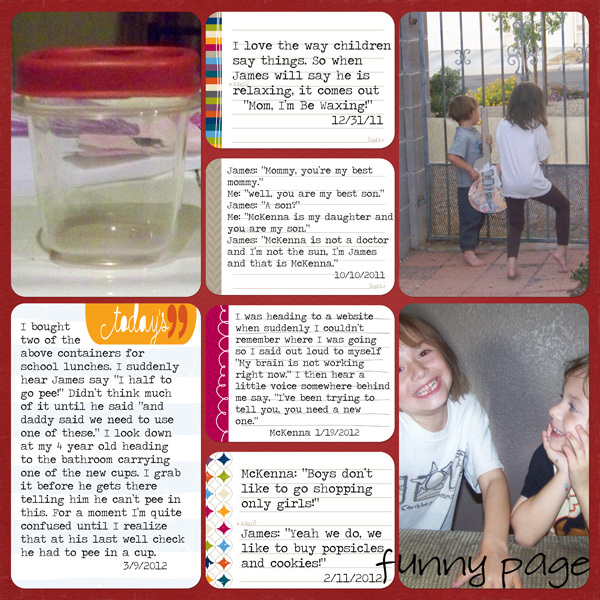 Here I created a funny page using some of the funny things my kids said during 2011 and 2012. The background paper is from Kristin Aagard's Little Builder available at After Five Designs. The remaining layout was used with Becky Higgins Project Life. I went to Digital Project Life and clicked on Jessica Sprague and chose the Cobalt Edition Horizontal Journaling Cards and Project Life Template Design D. This just made it easier to get everything lined up on the page and the journaling cards fit perfectly within the template and make it easy to record your funny moments. I'm going to be making some changes to this blog, making it more of a review blog for Digital Scrapbooking products and to share some funny things my kids will say. 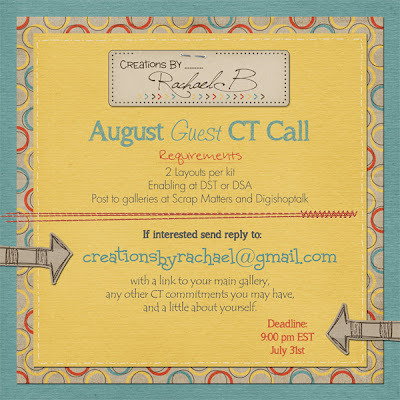 I'm not on any creative teams or any marketing teams for Digital Scrapbooking Designers. Kits and templates that you will see me review and use were purchased by my own money and because I chose to purchase that kit for one reason or another. I may guest for a designer at times, but will always state that within the post when promoting their product. I love creating layouts to capture my kids memories and sometimes I see a kit that I get excited about that I know would be perfect for some photos I may have, so I thought since I don't belong to any teams (I used to belong to several in the past) I would just start reviewing kits as a digital scrapbooker customer. Almost a week ago, a tragic accident took the life of an adorable little 6 year old boy named Gabe. To help with the hospital and funeral costs, approximately 22 designers came together and designed this huge kit - A Gift for Gabe. It includes a full alpha set, 68 papers, 104 elements, 3 templates, and 6 word art - all for $7.99. It's available in the Scraps N' Pieces store. RETIREMENT SALE! Creations By Rachael B is Retiring. I have some sad and good news. The sad news for us is Creations By Rachael B is retiring, but the good news is she is having a 50% off retirement sale in her shop at After Five Designs until March 28th. Gimme Layers Stacked ‘n Clustered Vol. 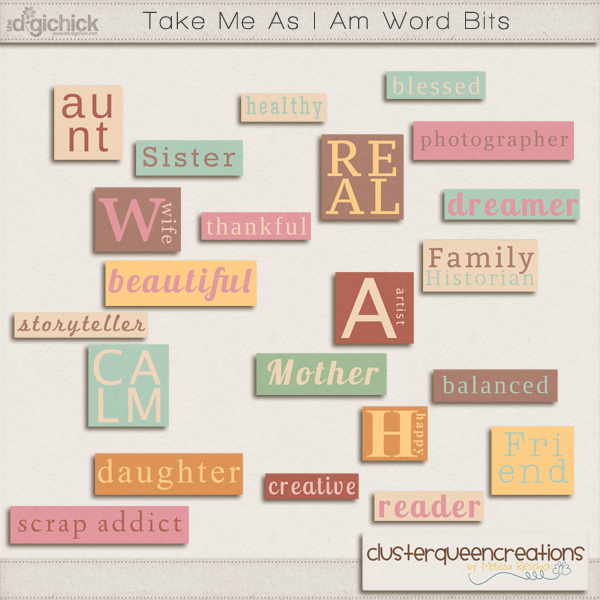 2 by Cluster Queen Creations is available at The DigiChick. You can purchase the full templates, just the clusters, just the stacks, the clusters and stacks in a value bundle, or all three in a mega bundle. And another one where I used one of the stacks and two of the clusters. I also used No Girls Allowed by Cluster Queen Creations. I’m really having fun guesting for Cluster Queen Creations this month. Here is one of her old kits: No Girls Allowed and I also used one of her amazing templates from Gimme Layers Vol. 19, to create this fun boyish layout of my son James. NEW! 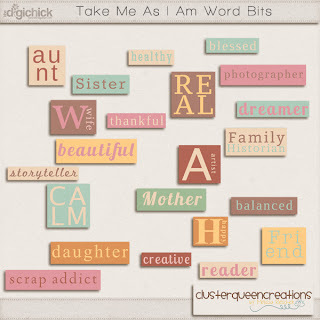 From Cluster Queen Creations! I’m so excited to be guesting for Cluster Queen Creations this month. Not only does she create fantastic templates, she creates beautiful kits as well. And she has a brand new kit released today in her shop at The DigiChick.